With the launch of our new partnership with Cards for Causes, you can now raise up to 6 per cent in donations for Cats Protection just by spending or topping up on your store cards. 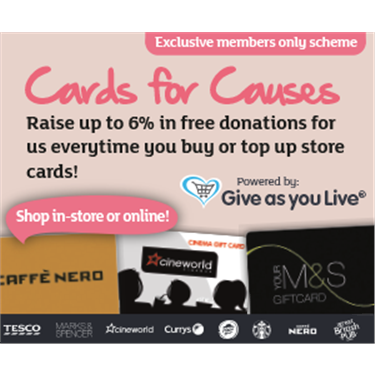 Cards for Causes has an extensive range of shopping cards and e-vouchers from popular stores and services – from Marks and Spencers and Argos to Starbucks, Caffe Nero and even Cineworld. The cards can be used for one-off purchases, everyday shopping or to be given as a gift, both in store and online. Each time you purchase one or top it up, Cats Protection will benefit from up to 6 per cent of the amount at no cost to you – ideal if you want to raise money as you shop. With Cards for Causes, you could make a real difference. On average, it costs Cats Protection around £2 to cover the entire cost of care for a cat each day. By spending £20 per week on your morning coffee at Starbucks or Caffe Nero, you could raise £60 per year, covering the entire cost of a cat’s care for a month. A family with a weekly grocery shop of £150 could raise around £200, enough to microchip 40 cats. • Simply follow this web link to visit the Cards for Causes website – following this link will automatically select Cats Protection as your chosen charity. • Select an e-voucher or store card. You can filter by card type as well as whether you want to use this online or in store. • A percentage of your purchase will be donated to Cats Protection. • Cats Protection will continue to receive a donation every time you top up your card or purchase additional cards for yourself or as gifts.